Each year, millions of children visit amusement parks and carnivals, with their family, with friends, or with school groups. Whether or not they accompany their children to the amusement park, parents have a responsibility for their children’s safety, for both general supervision and while on the rides. The C.S. 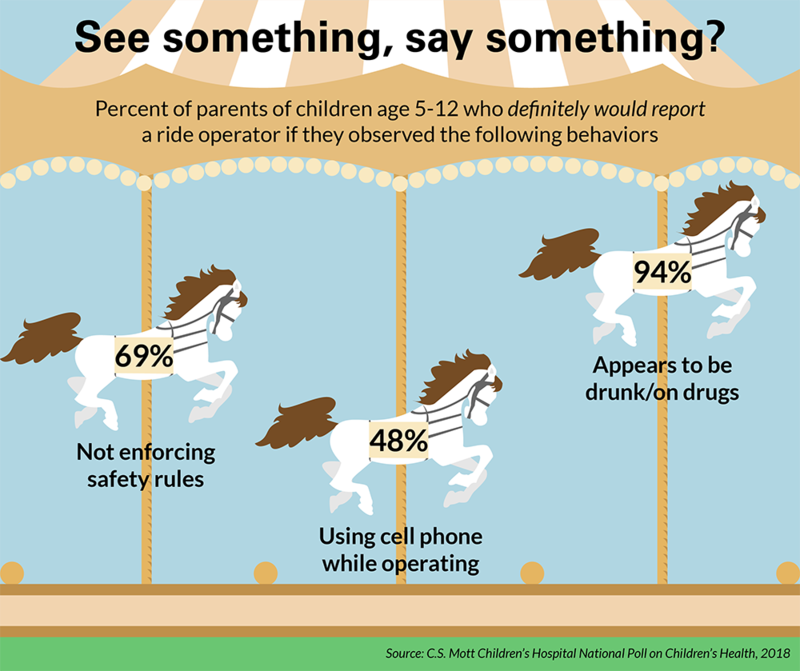 Mott Children’s Hospital National Poll on Children’s Health asked a national sample of parents of children age 5-12 years about their views on keeping kids safe at amusement parks and carnivals. About 4 in 5 parents (82%) reported that their child had been to an amusement park and/or a carnival in the past three years, with more going to amusement parks (69%) than carnivals (57%). Most parents (85%) said they accompanied their child to the amusement park or carnival, while 30% said their child went with friends or other family members and 6% with school groups. With regard to supervising their children age 5-12 during a trip to an amusement park or carnival, most parents (89%) said their child had to stay with them or another adult at all times. Six percent of parents had set check-in times for their child to make contact with them, either in person or by cell phone, and 2% set a specific time to leave. Most parents (79%) reported they talked with their child about what to do if they got lost or separated at an amusement park or carnival, while 21% either did not or did not remember discussing what to do in this situation. When children go on rides at amusement parks or carnivals, 87% of parents believe that it is the responsibility of both parents and ride operators to make sure that kids are safe. However, parents varied in their views about reporting ride operator behavior. Almost all parents (94%) definitely would report a ride operator to a person in authority if they suspected the operator were drunk or on drugs, while 69% definitely would report a ride operator for not enforcing safety rules such as seat belts or height requirements. Less than half of parents (48%) definitely would report a ride operator for being on his/her cell phone while operating a ride. Parents’ opinions varied in how often they believed alcohol and drug testing of ride operators should be done. Nearly 6 in 10 (59%) preferred random testing, 13% weekly testing, 13% monthly and 3% yearly testing, while 11% thought checks should be done only in case of suspected drug or alcohol use. 9 out of 10 parents definitely would report a ride operator suspected of being drunk or on drugs to a person in authority at an amusement park or carnival. 6 out of 10 parents think ride operators at amusement parks and carnivals should have random alcohol and drug tests. 1 in 5 parents had not talked with their child about what to do if they got lost at an amusement park or carnival. Part of the fun of family trips to amusement parks and carnivals often includes going on rides. As with any outing, safety is an important concern for parents. This Mott Poll focused on children 5-12 years old – an age range that can present several unique challenges for parents at amusement parks and carnivals. On the younger end of this age range, children need consistent supervision to ensure they meet the height requirements for rides and that they understand other safety rules (such as keeping hands away from the safety latch). Children at the older end of this age range may want more freedom to roam the amusement park and go on rides with friends, without constant parental supervision. Almost all parents in this Mott Poll reported they stayed with their child at all times during visits to amusement parks or carnivals, although some used strategies such as a set check-in time, which might be appropriate for older children. However, even when parents plan to maintain constant supervision of their child, situations occur where children get separated from their parent. Therefore, it is important to always have a back-up plan. This should be part of pre-trip planning when parents can discuss safety rules, check-in times & locations, and what to do if they get lost. Proactive measures such as these can help to ensure trips to the amusement park or carnival are both fun and safe for all. Almost all parents in this Mott Poll believed both they and the ride operators have important roles to play in keeping their children safe. Understanding and following safety rules are important to prevent injuries. Just in over the last year, there were over 30,000 injuries at amusement parks and carnivals across the USA. Parents in this Mott Poll indicated that there were situations in which they would report a ride operator who was exhibiting unsafe behaviors. However, parents varied in what specific concerns would prompt them to take action. Nearly all parents would report a ride operator if that person appeared to be under the influence of drugs or alcohol. This concern was also seen in the majority of parents supporting random drug testing of ride operators. With this in mind, parents should be aware that training and supervision of ride operators is variable across amusement parks and carnivals; they should not assume that ride operators have been tested recently. There have been several reports in the media about operators losing their jobs for being high or intoxicated while on the job, often after management has been alerted by concerned parents or other guests. It is important for parents be aware of any concerns regarding ride operators to help make sure their kids stay safe at amusement parks and carnivals and report potential dangers to management. Over two-thirds of parents would also report an operator that did not enforce safety regulations. These regulations include making sure minimum height restrictions are enforced and also checking to see all restraints are properly secured, belts are buckled and that doors and safety bars are locked in place. Enforcement of minimum height restrictions help to make sure that the restraints fit properly, both so they hold the child in place and do not pose a choking risk. Around half of parents would report a ride operator who was on their cell phone while on duty. Even though cell phone use might seem benign, it can be a significant distraction that can increase the risk of accident or injury. Lack of attention to ride safety increases the likelihood of injury for children, and parents should consider contacting the management of the amusement park or carnival whenever they see anything that raises safety concerns. This report presents findings from a nationally representative household survey conducted exclusively by GfK Custom Research, LLC (GfK), for C.S. Mott Children’s Hospital. The survey was administered in April 2018 to a randomly selected, stratified group of parents age 18 and older (n=2,074). Adults were selected from GfK’s web-enabled KnowledgePanel® that closely resembles the U.S. population. The sample was subsequently weighted to reflect population figures from the Census Bureau. The survey completion rate was 61% among panel members contacted to participate. This report is based on responses from 1,214 parents who had at least one child 5-12 years. The margin of error is ±1 to 3 percentage points. Freed GL, Schultz SL, Singer DC, Gebremariam A, Clark SJ. Thrill ride: Keeping kids safe at amusement parks and carnivals. C.S. Mott Children's Hospital National Poll on Children's Health, University of Michigan. Vol 32, Issue 1, June 2018. Available at: https://mottpoll.org/reports/thrill-ride-keeping-kids-safe-amusement-parks-and-carnivals.